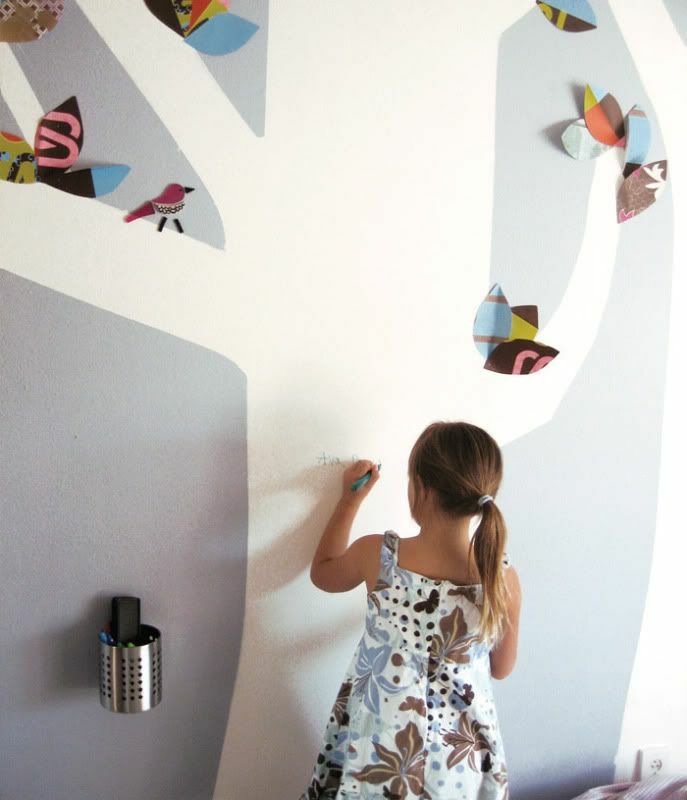 Quirky Jessi: Dry erase wall paint -- Write your thoughts anywhere! 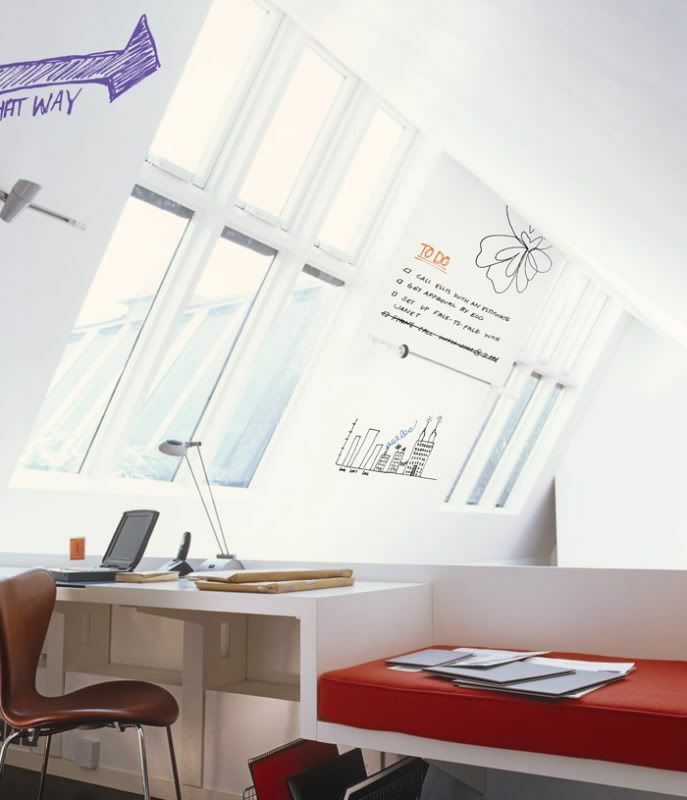 Dry erase wall paint -- Write your thoughts anywhere! Not to mention that it's formaldehyde-free (unlike many dry-erase surfaces), and sticking with dry erase instead of chalk cuts down on issues with allergies and asthma, plus keeps more dust out of the electronics. Wouldn't that be great in schools? And how about at work? In the meeting rooms, inside office spaces, in the cafeterias (changing daily menus :D), etc. Or how about for schedule areas like in the hospital nursing station where everyone's going on and off duty at different times? Really, go check out the main site for all sorts of places this stuff would be so convenient and ideas you'd probably never think of yourself. Obviously it's a bit pricey (you can write on it!! ), but if you're going to be spending money on paint anyway, or if it'd cut down on costs in the long run (less paper, not having to buy dry erase boards in the first place, fewer cleaning supplies and paint when the kids write on the walls anyway), then why not? 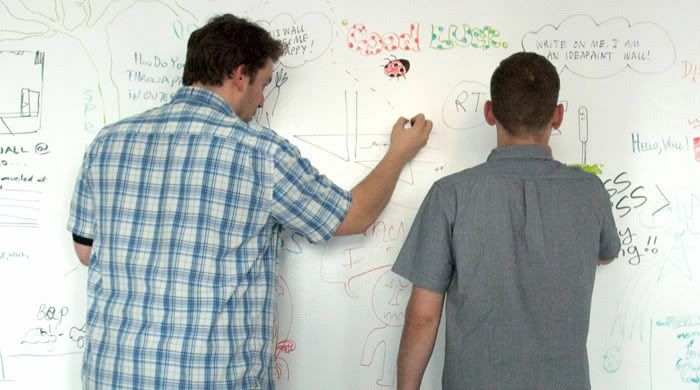 Check out Markee dry erase magic paint and it looks like it's even more reasonably priced. Oh, and it dries clear, too, so you don't have to choose from the dull colors like white and beige in order to be able to draw on your walls. I know I sound like an advertisement, but I'm in love with this stuff, and if I can't have it, hopefully others will get it, hehe. My sisters walls growing up were dry erase board. IT was AWESOME.